The Sixth to Tenth Commandments are all prohibitions against those behaviors that are mostly likely to tear apart communities. The Sixth Commandment is “You shall not kill,” and in other translations it is “You shall not murder.” Obviously, this helps maintain communal peace, since killing engenders reciprocal violence, which prompts yet more killing. Many commentators do not believe that this commandment forbids killing during times of war or killing animals, since there are passages describing killing enemies and animals, evidently without reprobation. However, Jesus evidently understood the prohibition against killing to include all humans, since he encouraged pacifism, saying, “all who take the sword will perish by the sword” (Mt 26:52), and the early Christians were pacifists. What about killing animals? 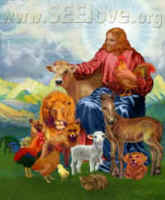 There have been many Christians who have refrained from killing animals themselves or by proxy (i.e., having someone else kill animals for them), and the first Christians, the Jewish Christians, were vegetarian (Hans-Joachim Shoeps, Jewish Christianity; Keith Akers, The Lost Religion of Jesus). In modern times, vegetarianism is a minority viewpoint in Christendom, though more and more people believe that Christian love and compassion should include all of God’s Creation. Many note that the Sixth Commandment does not exclude animals, and they believe that this was intentional. Indeed, Isaiah 1:21 uses the same Hebrew word for murder as in the Sixth Commandment, and in this context it appears that Isaiah refers to killing animals. Earlier in Isaiah 1, God condemns animal sacrifices and declares “your hands are full of blood.” (1:15) There is no mention of killing people in this passage, so “murderers” in Isaiah 1:21 evidently refers to those who have killed animals. From a Girardian viewpoint, mimetic theory and the scapegoating mechanism offers strong reasons to apply the Sixth Commandment to animals. Even today, killing animals has a sacrificial element (see Essays 28, 29), and Jesus said, “I desire mercy and not sacrifice” (Mt 9:13, 12:7). If we seek to abandon scapegoating, it will not suffice to transfer our sacrificial tendencies onto animals. Not only is scapegoating wrong and a violation of God’s will (according to the Girardian understanding of God’s will), but it keeps humans at risk. As long as people believe that scapegoating violence can maintain peace, then in times of great crisis, when animal sacrifices seem insufficient to restore order, humans become victims of the scapegoating mechanism. Next week, we will explore the last four Commandments.